SHANGHAI, April 21 (Reuters) - A tentative move by China's government to force foreign suppliers of electric-vehicle components to share technology and team up with Chinese companies has raised eyebrows, but few foreign companies have scaled back their big plans for the world's largest auto market. Since April 1, China's top economic planner has floated the idea on its website (www.ndrc.gov.cn) that foreign players who supply green vehicles and parts must partner with local partners and cap their holdings at 50 percent, a major setback for companies such as Delphi Automotive. But nearly all industry players, from Johnson Controls to Valeo SA and others, are gearing up to secure a foothold in a country where 10 percent of the vehicles on the road could be electric by 2020, double the share of the world average, according to Deloitte Touche Tohmatsu. "All these years, foreign parts suppliers have been able to operate on their own if they want to," said Yale Zhang, managing director of industry consultancy Automotive Foresight (Shanghai) Co. "But all of a sudden they are told to find a partner or else. Of course they will be upset. Why should they want to share technologies with anyone, especially those related with green vehicles?" At the Shanghai auto show this week, a Johnson Controls subsidiary announced plans to supply battery systems for two electric vehicles, the C30 and M30, made by state auto group Beijing Automotive Industry Company (BAIC). Johnson is also planning to set up a technical center in China and may follow that with a design and development center, testing labs and manufacturing facilities, according to Robin Choi, director of commercial business development for the Asia-Pacific division of Johnson. "We are kind of surprised that they limited it at 50 percent," Choi told Reuters. "It's a little bit of a concern for us. To be honest, we don't know what the result will be, but we are continuing the dialogue with the government. It's not official yet. If it is, we might have to follow the rules." The German auto parts maker Schaeffler is in the same boat. The company has been among a select few overseas suppliers that have been running their China business independently over the past decade. "We just have to be alert to watch very carefully about what will happen. No matter what the final outcome will be, we can contribute one way or the other," said Wolfgang Dangel, president of Schaeffler's Asia-Pacific division. "At the end of the day, we are still confident as we have enough technology and expertise on our hands." Schaeffler has just set up an E-mobility team in China, heavily focused on the automotive business. Hans-Peter Kunze, Valeo's senior executive vice president of sales and business development, also offered a positive spin on the proposed change before it is put into law. "It's still a draft and how many drafts have we seen in our lives?" he said with a laugh. Valeo is part of a consortium of suppliers capable of supplying a range of green technologies from electric motors to battery management systems. It has started to supply the Chinese market with start-stop technologies for energy-saving cars this year and already has several Chinese automakers on its client lists, which Kunze declined to name. Many suppliers are actively lobbying Chinese policy makers through various channels in the hopes they could end up getting a level playing field in what is arguably becoming the world's most important auto market. An upcoming visit to Germany by China's technology and information minister, Wan Gang, provides an opportunity for "communication," as Schaeffler executives like to put it. Wan, whose career included a stint in Audi AG , is the mastermind behind the country's green mobility blueprint. While most foreign parts suppliers are relatively muted in their criticism, some executives have not hesitated to speak their minds. "I think what they are trying to do is to mandate innovation," said Craig Giffi, global automotive sector leader of Deloitte Touche Tohmatsu. "It can create as much negative impact as positive impact." "Naturally this is the most attractive market all over the world, but you can create a bunch of policies to make it unattractive," he added. China, industry observers say, has a practical reason to open the door to outside investors to jump-start the market and achieve its ambitious target to have 1 million green vehicles on the road by 2020. Currently sales are estimated to be no more than a few thousand at best. "Frankly, the local industry cannot mass-market EVs on the back of what they have in technology in China right now," said William Russo, an industry veteran who is running his own consultancy, Synergistics, in Beijing. "Foreign companies have to bring more current EV technologies to the market." "It is the largest auto market," he added. "It will be the largest EV market, provided both the industry players and infrastructure players want to invest. I don't think China needs the investment capital, but they do need the know-how." Tesla Motors , which supplies powertrains to Toyota Motor's electric RVA and is setting its sights on China, is obviously frustrated. "It's a classic political economic model," said Diarmuid O'Connell, vice president of business development for Tesla. "I understand why the Chinese government wants to pursue it. When you have leverage, you want to use it to develop your domestic industry." "But we are not constrained like that in any partnerships," he said. "It certainly gives any company the cause to think very seriously whether it's worth the effort." Tesla, however, still wants to be part of the game "if the Chinese government is practically endorsing the technology and saying if EV is going to take off, it should take off here," he said. Wang Dazong, president of BAIC, seemed to have his own interpretation of Beijing's tentative rule. China became the world's biggest auto market in 2009, when other regions were reeling from the worst downturn in decades. But as demand for cars in China rose again last year, its sales shot past even the historic peaks of the U.S. market. With China established as the biggest market, its annual auto shows — held alternately in Shanghai and Beijing — are now top venues for automakers seeking to display their newest models and technology. Some would argue the top venues. "Not all automakers have to be at all the global shows. But everyone has to be in Shanghai and in Beijing," said Michael Robinet, Northville-based vice president of global forecasting at consulting firm IHS Automotive. "That should tell everyone how important that country is to the global auto industry." This week, automakers will unveil major models at the Shanghai Auto Show that they once would have reserved for the top-tier Geneva, Frankfurt or Detroit shows. BMW is introducing its 6 Series coupe, Audi is staging the world premiere of its Q3 compact SUV, while General Motors Co. will roll out the all-new Malibu midsize sedan. GM's decision to introduce the Malibu in Shanghai, instead of at the New York show this week, sends a clear message. "It's saying, 'We sell more vehicles here than we do in North America,'" said Michael Dunne of Dunne & Co., a Hong Kong investment firm. "It's a signal of where GM has its priorities." Because China is still an emerging market even though it's huge — the equivalent of a baby whale — growth rates are steep and uneven, and risks of reversals abound. But the opportunities for automakers are enormous. Sales in China rose 32 percent last year, to 18.1 million vehicles, after surging 46 percent in 2009. Most forecasters expect slower growth this year, but still in double digits, led by burgeoning demand for cars in China's secondary cities and inland regions. The congestion in the affluent coastal cities, coupled with rising incomes in China's hard-scrabble interior, are fueling two trends that will be evident at the show: the proliferation of advanced, clean technologies and the rise of new "indigenous" brands. GM and its Chinese venture partners already sell vehicles under the Buick, Chevrolet, Cadillac and Opel brands. Its partners, Shanghai Automotive Industry Corp. and Wuling Motors, also have their own brands, such as SAIC's Roewe. This week, GM and its partners will introduce the first model produced under a new brand, Baojun, by the GM-SAIC-Wuling venture. The Baojun 630 is a family car almost as big as the Malibu, but will cost thousands of dollars less. GM isn't confirming the price, but Chinese media expect it will be between 50,000 and 70,000 renminbi, or $7,700 to $10,700. Nissan Motor Co. and Honda also have announced plans for indigenous, or local, brands as the Chinese government has been urging automakers to do. Analysts say that, as Chinese authorities see it, they are offering foreign automakers access to a huge market — and in turn want global automakers to help establish China's car industry. That's why the government has allowed foreign carmakers to produce vehicles locally and avoid import duties only in ventures with local partners. Under this arrangement, foreign and Chinese carmakers have been raking in profits, but the desired technology transfer hasn't taken place. As a result, authorities are pressing global automakers harder to create indigenous brands with their partners, although it isn't a formal requirement. "It's not a black-and-white thing," said Bill Russo, president of Synergistics Ltd., a consulting firm based in Beijing. "It's never black and white in China." Nissan and its partner Dongfeng Motor Group will show a concept in Shanghai for a vehicle to be built under the new Venucia brand. Honda has created the new Li Nian brand with a Chinese partner, and Germany's Volkswagen AG is said to be close to announcing a local brand. Some executives with non-Chinese automakers resent what they consider the government's strong-arm tactics, but others say foreign automakers also stand to benefit. Currently, they don't have vehicles for the next big wave of customers: first-time buyers in China's interior. "You probably don't want to take your brands down enough to reach consumers in those segments," Russo said. The government's priorities also will be reflected in a slew of plug-in hybrid and electric vehicles from global and Chinese brands at the Shanghai show. Ford Motor Co. is expected to show electric Focus and C-Max models, while BMW and its venture partner Brilliance Automotive will unveil a prototype for a plug-in hybrid developed on the long wheelbase version of BMW's 5 Series sedan. China's government is investing large sums and funding big pilot projects to encourage demand for clean vehicles. The country already is struggling with air pollution in its cities, and it wants to break its growing reliance on imported oil. The government in Beijing is now expanding its New Energy Vehicle plan to include more subsidies, consumer incentives, tax breaks and fleet purchases of plug-in and electric vehicles. Chinese automakers, seeing an opportunity to compete in this fledgling sector of the auto industry, will be displaying their own high-tech cars. State-controlled Beijing Automotive Industry Holding is to show prototypes of an electric car and compact minivan. China's leading manufacturer of advanced technology vehicles, BYD Auto Ltd., will exhibit its F6DM model and unveil a 3A concept for a sedan. BYD, a private company that counts billionaire Warren Buffett among its investors, also has a venture with Germany's Daimler AG. Volvo Cars on Tuesday gave the first sign of its design direction under new Chinese owners, unveiling a global concept car at the Shanghai car show that the Swedish group hopes will help shed its stodgy image. The unveiling of the car – made larger, flashier and sleeker than traditional Volvos, partly to attract Chinese buyers – has been keenly awaited for the clues it could give to the working relationship between the group and Geely, the Chinese carmaker that bought Volvo Cars last year. Geely’s purchase of Volvo Cars is the biggest acquisition of an overseas brand by a Chinese carmaker. It is viewed as a model of a successful acquisition in the automobile sector by Beijing, which is encouraging other China carmakers to look overseas for targets. Stefan Jacoby, chief executive of Volvo Cars, said the concept car, the Tiandi or Universe, “has nothing to do with Geely” and was not influenced in any way by the Chinese company, which is run entirely separately from Volvo. “I don’t report to Li Shufu,” Mr Jacoby said, referring to the Geely chairman, who has said that he differs with the management of Volvo Cars on the kind of Volvo he would like to see sold in China but that he will defer to Volvo’s judgment. “I don’t see that this car has any Geely influence whatsoever,” said Bill Russo, head of Beijing-based Synergistics car consultancy and former head of Chrysler in China. Launching the car at the start of the Shanghai show, Volvo Cars officials made only scant mention of Volvo’s traditional brand values of safety and environmental friendliness, focusing instead on its “voluptuous curves” and “coupé-style roof line”. He said Geely had a “deep understanding of the auto industry” and more patience about return on investment than private equity owners. Mr Jacoby expected China increasingly to influence the design of car models. He pointed out that the Chinese car industry was becoming increasingly competitive. About 2,000 carmakers and component suppliers from 20 countries are participating, showcasing 75 new car models, 19 of which are making their world debuts, he said. The growing confidence of Chinese carmakers had led to one unexpected shift in the focus of the Shanghai show, analysts said. “The electric vehicle theme that was so prevalent in the last two [Chinese] auto shows is not as front and centre at this show,” Mr Russo said. Beijing is heavily promoting electric vehicles as an interim solution to the country’s environmental and energy dependence problems, but electric vehicle sales in large numbers are not expected for several years. GM's China strategy is going well. It's China's GM strategy that should have the car maker worried. Figures for the first quarter might not show it, but General Motors has made some smart moves in China. Year-on-year sales growth slowed to 10%, down from 28.8% in the same period last year. Growth slowed particularly sharply in March. 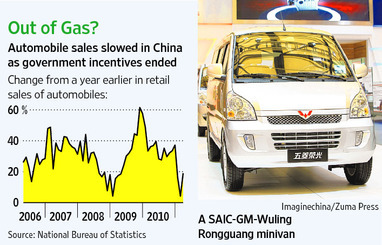 Weak demand for minivans—a section of the market where GM leads through its joint venture with Shanghai Automotive Industry Corp. and Liuzhou Wuling Motors—was a contributing factor, hurt by the end of government incentives and constraints on production. Over a longer time frame, however, GM's Wuling venture has been a roaring success. GM's technology and expertise helped transform Wuling from a small, regional manufacturer in 2001 into a market leader with more than a million unit sales in 2010. Wuling vans are now exported, in small number, to South America and the Middle East. The aim is to produce vans and sell them under the GM brand in India, taking advantage of the U.S. company's network of dealerships there. Giving GM access to a new market segment using a low-cost Chinese product platform—while at the same time giving Wuling and SAIC access to a U.S. brand—plays to the strengths of all partners, reckons Bill Russo of auto consultancy Synergistics. Wuling is also GM's route into the market for affordable passenger cars. Cars produced by the partnership and marketed under the Baojun brand, on display at an auto show in Shanghai this week, will target price-conscious consumers in China's second- and third-tier cities. GM says the joint brand is a way to target buyers at a lower price point without denting its international image for producing high-end vehicles. But there is a catch. Unlike the old JV approach, the joint brand involves intellectual property being held in common with the Chinese partner. Michael Dunne, an expert on the Chinese auto sector, believes the endgame of that joint ownership won't be good news for GM and other foreign players: "China has made no secret of its desire for national firms to dominate the domestic market; this is part of that process," he says. From 2000 to 2010, Chinese brands' share of the domestic passenger-vehicles market increased from 18% to 32%, according to J.D. Power & Associates. Japan provides a sobering parallel. Local manufacturers such as Nissan cut their teeth making foreign cars like Britain's Austin A40 series in the mid-1950s. Within a decade, such tie-ups were a thing of the past, and Japan had overtaken Britain in terms of vehicle production. Eventually, Japan's car makers made big inroads into Western markets. GM's new joint brand will boost Chinese sales, but it will also add horsepower to China's homegrown efforts to eventually target drivers the world over.